iCue aims for Educational Institutions with a simple and easy to use applications. 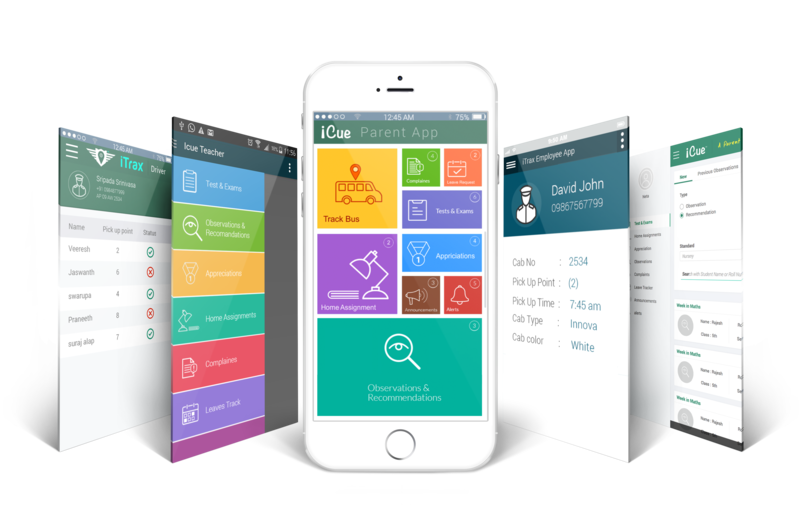 iCue is a device independent state-of-the-art solution that helps parents, teachers, and management to communicate and access information through hand-held devices such as mobiles, tabs, laptops. Unlike other products in the market, our application has a simple-to-use and intuitive user interface. It enables everyone to benefit from readily available data shared in real-time, boosting efficiency and reducing the number of systems an institution maintains, all while also eliminating redundant data. In short, our iCue application addresses the needs of all the stakeholders of a Educational Institutions. O-Relics, is a technology, a combination of Hardware and Software developed by us. It is an intelligent data analytics platform, aimed to increase the sale opportunities for all retailers in all business sectors, the product is still under development stage. iTrax is a fleet management solution aims to solve problems in employee transportation for corporates and transport management for educational Institutions. iTrax provides an intelligent routing with easy to use services. Employees\Parents can track vehicle live in mobile phones and avoid long wait time. We have a unique solution that provide easiest way to plot precise stop points and locations without the use of maps. We provide telematics for the entire fleet. Fleet admins can view the live motion and speed of each vehicle, also has provision for configuring hi speed alerts. Provide Complete reports such as average mileage and total distance travelled etc. iTrax has Apps for Drivers, Apps for Employees\Parents, device independent software for fleet administration. iTrax helps avoiding the hassles of continuous phone calls between bus drivers and employees\parents\fleet admins on the status of the vehicle, through a live tracking facility shared to the employees and parents and fleet administration. Copyright 2017 © Thoughtniques. All Rights Reserved.